Temperature control is the key of Ruhrstahl-Heraeus (RH) process in steelmaking plant. The accuracy of RH control model greatly affects the molten steel temperature fluctuation. To obtain RH control model with higher accuracy, an improved case-based reasoning (CBR) model based on attribute weights optimized by genetic algorithm (GA) was proposed. The fitness function in GA was determined according to the prediction accuracy of end temperature of molten steel in RH; then, GA is used to optimize all the attribute weights based on known case base. 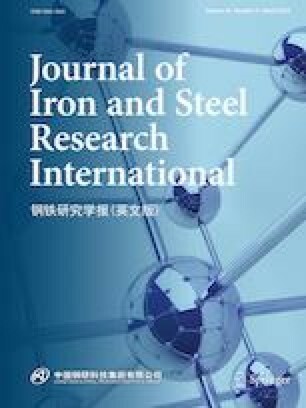 An improved CBR model that contains the optimized attribute weights was applied to predict end temperature of molten steel in RH, and the prediction accuracy was calculated. Four methods, CBR based on attribute weights optimized by GA (CBR–GA), ordinary CBR, back propagation neural network (BPNN) and multiple linear regression (MLR) method were employed for comparison. The results show that in the error range of [− 3 °C, 3 °C], [− 5 °C, 5 °C], [− 7 °C, 7 °C] and [− 10 °C, 10 °C], the prediction accuracy of CBR–GA was improved by 19.99%, 28.19%, 27.11% and 16.3%, respectively, than that of MLR. Compared with BPNN, the prediction accuracy increased by 3.22%, 7.44%, 5.29% and 2.40%, respectively. Compared with ordinary CBR, the accuracy increased by 5.43%, 5.80%, 4.66% and 2.27%, respectively. This work was financially supported by National Key Research and Development Program of China (No. 2016YFB0601301), National Natural Science Foundation of China (No. 51574032) and Fundamental Research Funds for the Central Universities (No. FRF-TP-16-081A1).